The media in Kenya has not historically been kind to women leaders. In an effort to right that, Women and Girls Lead-Kenya launched the “Women in the Red” radio show on Radio Maisha to highlight extraordinary women leaders who are blazing a path for future generations. “Women in the Red” is also the name of WGL-Kenya’s media campaign, which aims to cultivate and celebrate women leaders. It refers to the current deficit in women’s leadership in Kenya. Recently, the show put out a challenge to listeners – over one million Kenyans all over the country – to nominate women from their own communities for the Listener’s Choice Awards. Among the three finalists, Margaret Tawa of Nyakach – founder of the Nyalunya Development Community Based Organization, which supports orphans and vulnerable children by enrolling them in a kindergarten school that provides basic knowledge to enter public schools – was nominated and won by a landslide. Drawing on her wide network and strong community organizing skills, Margaret campaigned for herself among friends and colleagues on Facebook to bring home the win. We had a moment to speak with Margaret about her passion to increase support for women leaders in a brief interview prior to the awards announcement. There are many challenges that come with the territory of being in a leadership role, such as tackling poverty, domestic violence against women or reducing school drop-outs. 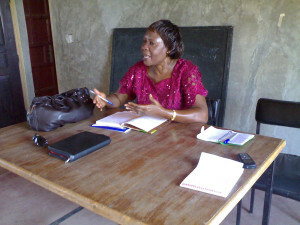 Margaret has encouraged women to come together and support one another by forming groups within their village. Through this effort of inspiring women to unite, they are now able to submit applications for open opportunities as an assistant chief. “Women are really responding and it is very nice. We have many women chiefs in Nyakach right now and even in many other places we are encouraging them” explained Margaret. Margaret has a strong desire to be the best advocate for her community and has made the commitment to go back to school at the Kenya College of Accountancy and receive a degree in county governance and management. She explains this is not about a job or a salary, but to be an asset to her community. “I want to give people a way forward. I want to give them advice…I want to be a role model,” she said. Her win at the Listener’s Choice Awards has given her an automatic nomination in the Women in the Red Leadership Awards – a national contest that will honor the most remarkable women in Kenya. The goal of the contest is to move closer to realizing the ‘Kenyan Promise’ put forward by the 2/3 gender rule in the 2010 Constitution that aims to bring more women into leadership roles. This goal has yet to be met. Check back later this month for updates on Margaret’s nomination!